This cafe has now closed down. 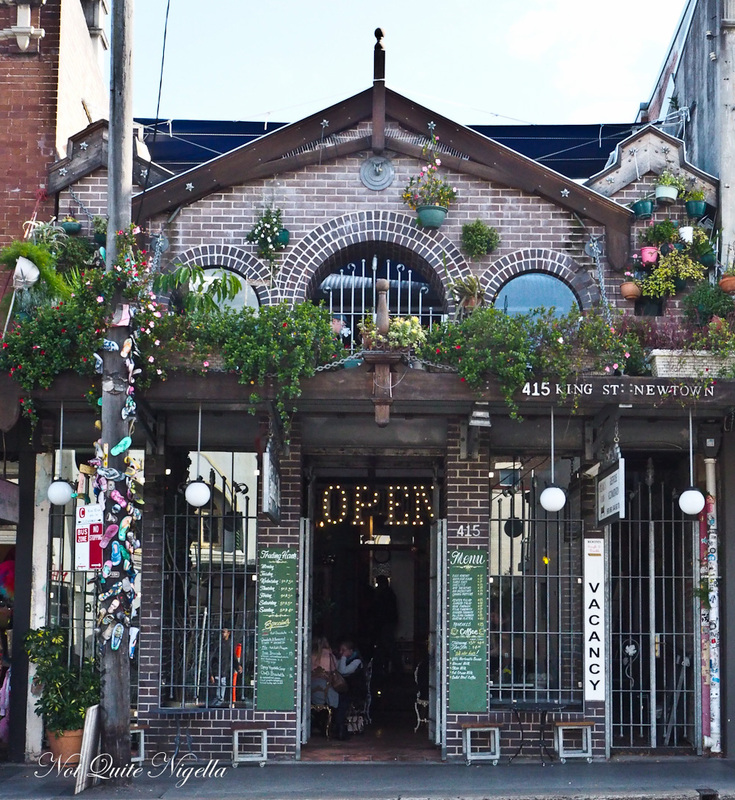 Newtown's King Street is a favourite haunt of ours and we often find ourselves popping into restaurants, cafes and businesses there. A while back, after dining at a restaurant on the southern end of King Street, we walked past a facade. There were laminated letters threaded between the bars of the building detailing some sort of injustice and we looked at them with a detached curiosity, not quite understanding what they meant. Little did we realise the turmoil brewing behind 415 King Street. King Street's original buildings reflect two centuries, the late 19th and 20th century. The building's owner of over 18 years Chelsea Kovic has been engaged in a war with her neighbours for over a decade. 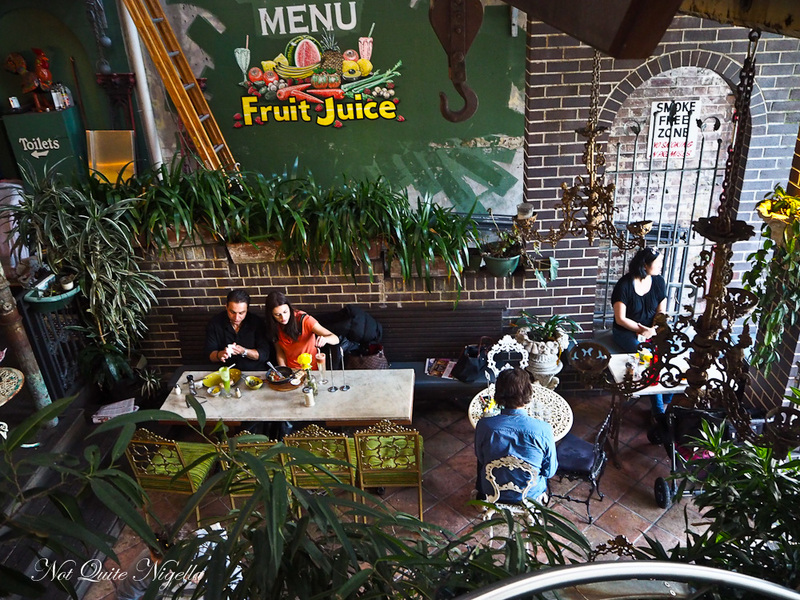 Chelsea's plans for renovating the formerly derelict building included adding 17 trees and cleaning it up along with wanting to remove the 1907 facade to expose the Victorian 1830's front and open up a courtyard cafe. When she started it was a guest house at the time called Chelsea's on King. Chelsea herself is genuine and sweet and eager to talk about what happened. Work began in February 2006 but her neighbours intervened while the facade was being taken down producing a stop work order saying that their heritage rights were breached and they wanted to preserve the facade from 1907 which matches theirs (the properties were built at different times). They have the support of Marrickville Council and Chelsea has fought them alone. She has security cameras installed, been harassed, physically assaulted and suffered depression because of this long battle and claims of corruption have been lobbed at the council and others. 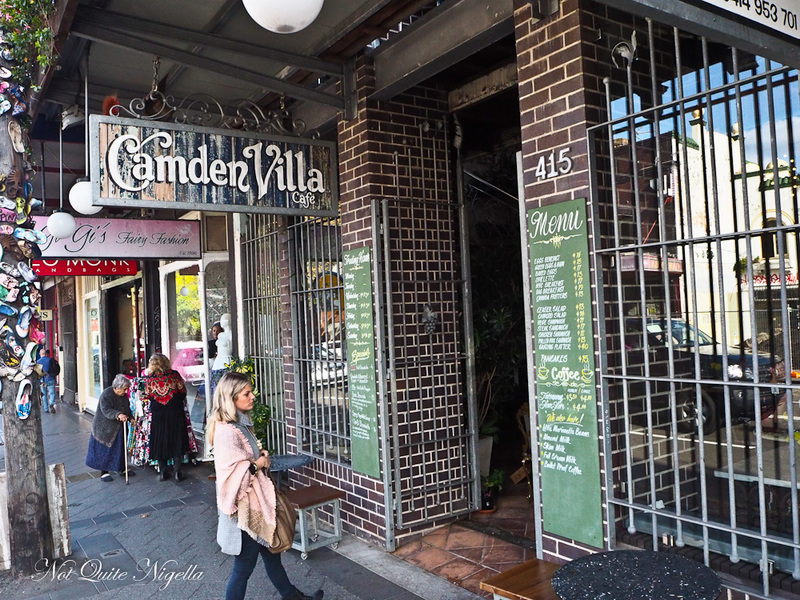 Now it is a cafe called Camden Villa Cafe named after Camden Villa Estate, purchased in 1853 by Thomas Holt, a wool merchant. When we walk into the cafe, you wouldn't have any idea that any of this has happened. 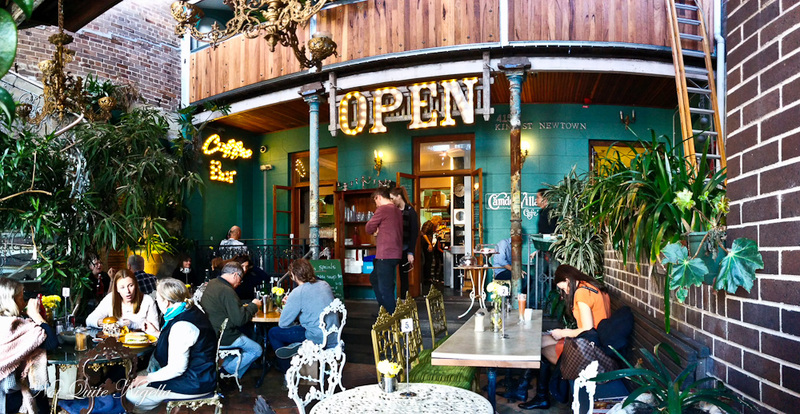 The layout of the cafe is unusual but beautifully welcoming. There is a front mezzanine section as well as the main section downstairs in the covered courtyard which features lovely lace ironwork and hanging chandeliers. The kitchen is in the main building. 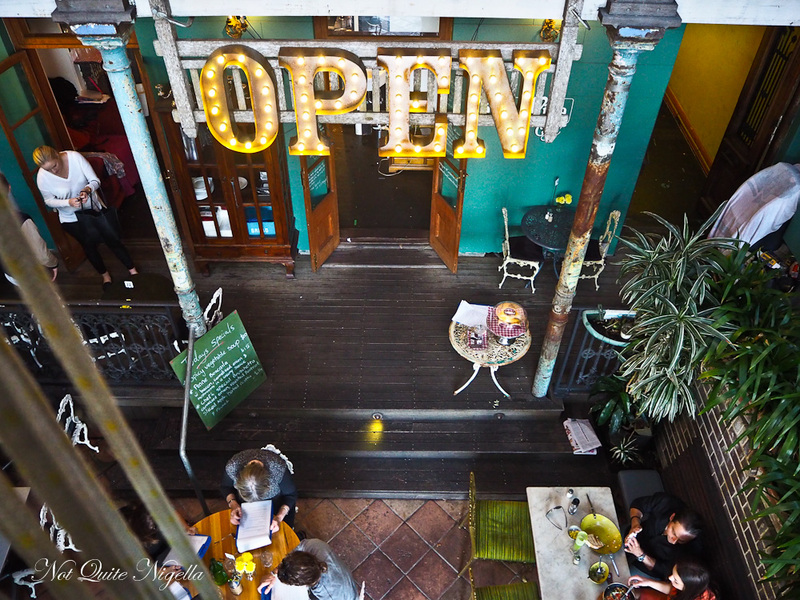 An illuminated "Open" sign welcomes guests and service is friendly. The menu says that all of the produce is locally sourced and organic and there's a sign inside referencing this and the battle to save 415 King Street (which is what urged us to look at the story behind it once we left). 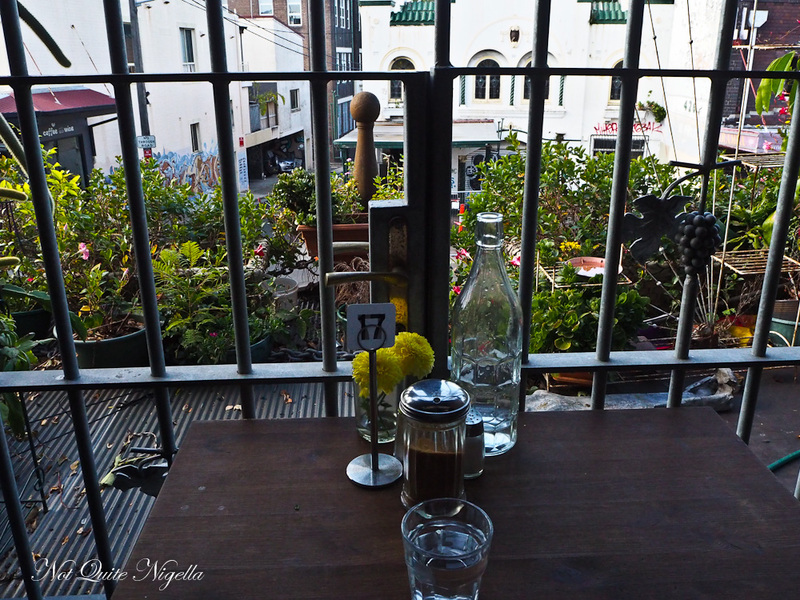 We perch on two tiny garden chairs until a banquette table frees up. "Everything that we serve is in big portions," our waitress says. I can almost picture the always ravenous Mr NQN's pupils widening dramatically. As a man that burns calories like I seem to consume them, feeding him is always a priority. 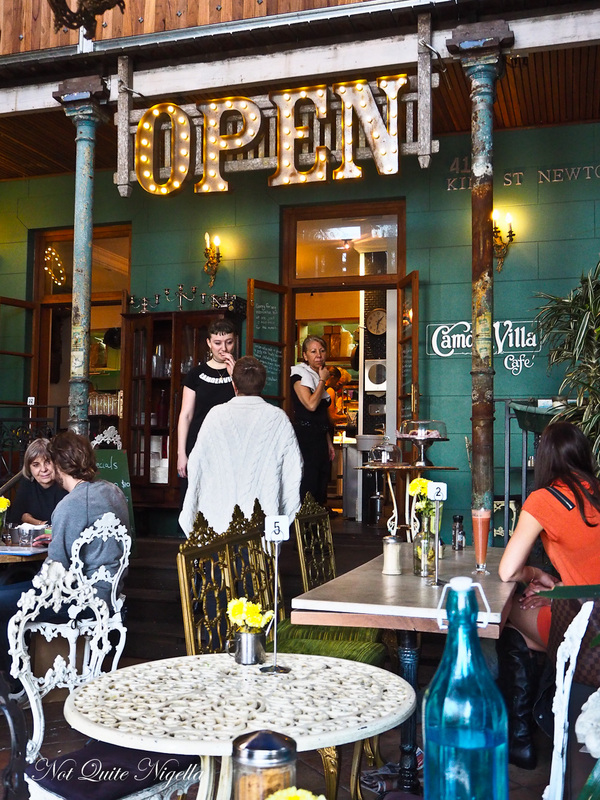 Being Newtown, there is a good selection of vegetarian options and the most popular items are vegetarian. We order a couple of freshly pressed juices and two mains. We aren't waiting long and our mains arrive first. Mr NQN is not usually a pork person but he can't get enough of the NYC breakie. 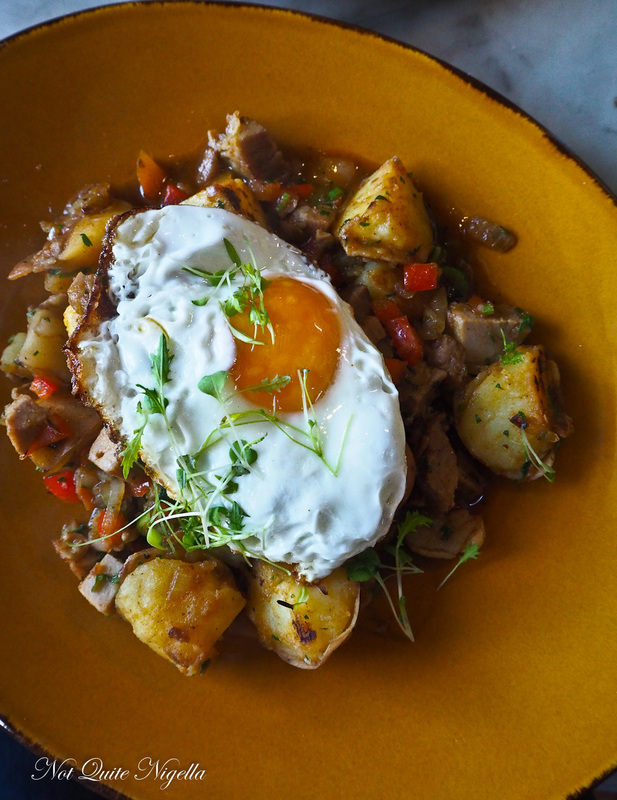 It's sauteed potatoes, onions, capsicum, chilli and four hour roasted pork cubes finished off with a fried egg. In fact he says that if I don't want any, he is happy to eat the entire thing. This version of American home fries (skillet cooked potato rather than French fries) is comforting and delicious and perfectly seasoned. The sunny egg is a nice touch. 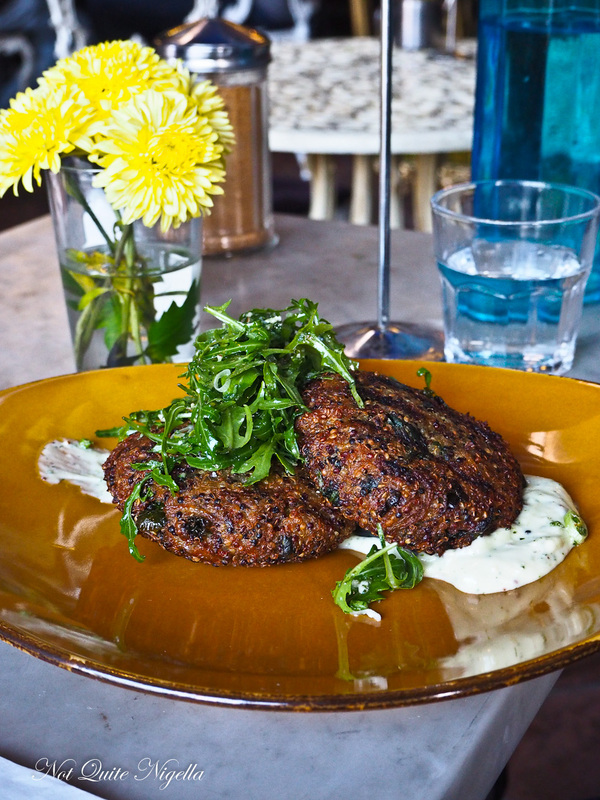 It's fine though, I'm just as smitten with the quinoa fritters. I wasn't sure at first but was convinced by the waitress. They're two large, crunchy patties with quinoa, kale, caramelised onion and lemon with an aioli sauce and a rocket salad. Again like the other dish it is perfectly seasoned and you wouldn't really notice that there isn't meat it's that tasty. The only thing is that it could use a touch more aioli. The patty is also available on a burger which I spot at a nearby table. 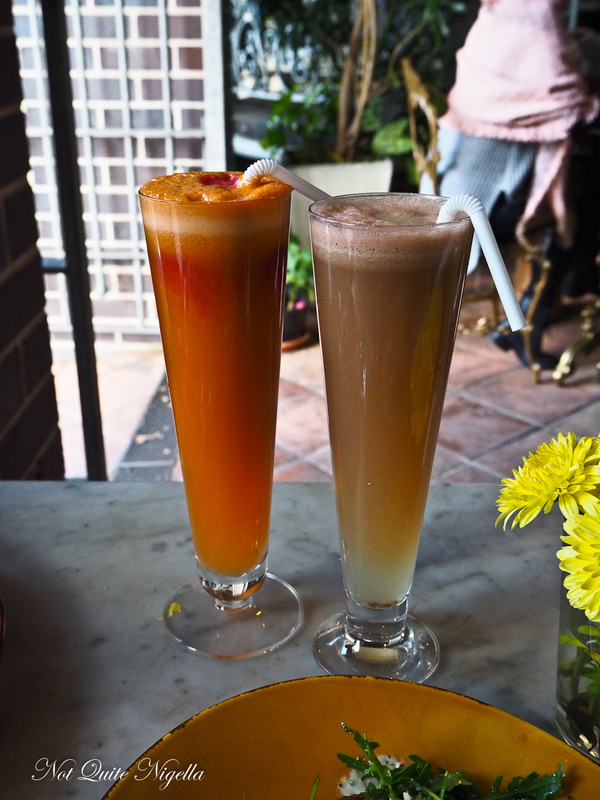 The freshly made juices arrive. The Red Warrior has carrot, beetroot, apple, lemon and ginger while the Slim to None has watermelon, coconut water, apple and ginger. They're both naturally sweet with all of the flavours coming through nicely. There are a few sweets from strudel, brownies and banana bread. 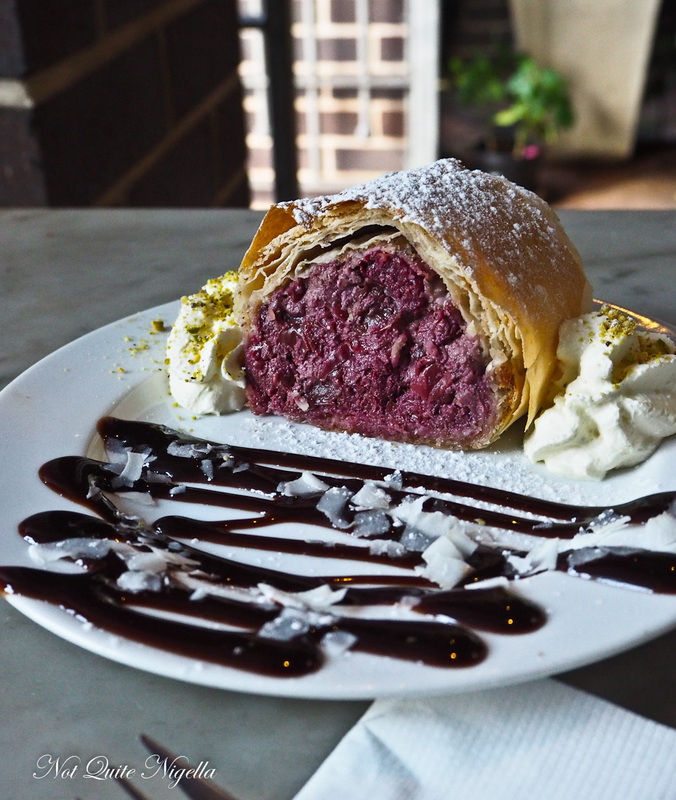 We order the strudel and the pastry is crisp and full of plump cherries with some cream on the side. After we pay and leave there's a reminder of what has happened here as we notice a power pole outside with shoes stuck to it. This remains Chelsea's outlet for her frustration and she nails any shoes left outside her cafe to the pole. She writes messages on some of these to her detractors, still determined to one day restore her building to its former heritage glory. So tell me Dear Reader, do you notice architecture in buildings? Do you like reading the back stories of a business? Have you ever battled a council or neighbours?